A Continental mid 19th century walnut finely carved relief carving of a Medieval man in a moulded frame, (possibly Italian). 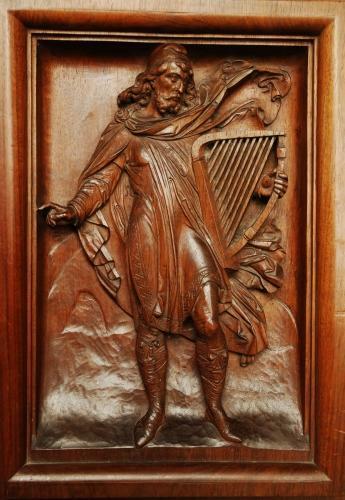 The carving consists of a man dressed in Medieval attire and he is holding a Medieval harp. This is possibly a panel from an extremely decorative and important door or panelling and there is evidence of the mortices where it would have been fixed. This panel is in very good condition and would make a super wall hanging.